For whatever reason, I seem to go to London when my life is in some sort of turmoil. When I went in high school, it was after my mother died. When I went in 2002, it my first birthday without my dad and the 10th without my mother. This year, well, there’s some behind-the-scenes stuff going on. I’ve tried to stay away from the real world all week - but it hasn’t been easy because I’m still in school, doing an online class. I’ve spent this week lost in London, being a happy tourist and forgetting I’m supposed to be worrying about things at home. It’s been healing. I don’t know why, but London “fixes” me when I’m broken. It’s probably got something to do with the fact that I’m far away and completely lost in what I’m doing. Staring down the Royal horsies at the Royal Mews. Quacking at people while on a Duck Boat (just as much fun as the ones in Boston, in case you’re curious). Getting a wicked bad case of vertigo on the London Eye. Falling in love with the show “Mock the Week”. Going in the circle, and touching the stones (!!!! ), at Stonehenge. Here’s the part of the programme (HA!) where ya’ll think I’ve lost my mind. Or I confirm that fact for you. Whatever. Ever since I gave up on the idea that there is a Christian God, I’ve been interested in other religions. For whatever reason, I was drawn to the pagans. 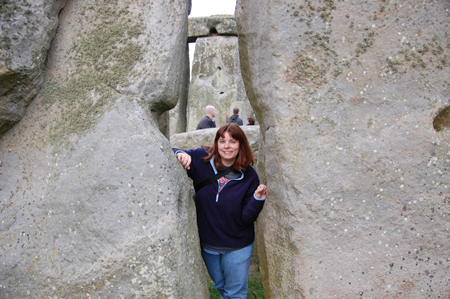 Stonehenge, of course, is a spiritual center of sorts. You can google it all you want to get the history, but I can tell you, there is some sort of magick going on over there. I felt it in high school, I felt it in 2002 and this year, it rocked my world. We spent a fortune on a tour SPECIFICALLY because we could go into the circle. At sunset. We got to play with dowsing rods* and prove that there is some sort of power there, in that circle. I can tell you, there is something going on there. It’s not quite that the rocks hum or vibrate or anything really perceptible, but there is something going on. I can feel it, but I’ve always been tapped into that “other realm”. (A story for another time. Maybe Halloween.) Standing within the stones, touching them, walking among them was such an experience and I’m glad that we were able to have that opportunity. It put a lot of stuff into perspective. Stuff that had been carried forward for years… stuff that was better off being left firmly in my past. When we boarded the bus to leave, I felt such incredible closure. It’s almost as if whatever power lives there knew what I needed and gave it to me. *Dowsing rods are debunked more than they’re proven to work. David Allen has proven, to me, beyond a shadow of a doubt, that if you think of something like spinning a paper clip that’s hanging on a string, you can make it happen without moving your hand. So, I know some of it is me. The rest… well, if you’ve ever had a planchette fly across an ouija board and crash into a wall when YOUR hands are the only ones on it, you’ll probably understand where I’m coming from.